The new EXO1 sonde with ports for 4 sensors. Parameters options include: Temperature, Conductivity, Depth, Optical Dissolved Oxygen, pH, ORP, Total Algae (Blue-green Algae and Chlorophyll), Turbidity, and fDOM, plus 4 calculated parameters. EXO represents the intersection of Environment and Observation with a new generation of monitoring technology. A smart, ﬁeld-ready water monitoring platform. EXO offers a wide range of capabilities to those dedicated to monitoring natural aquatic environments such as oceans, estuaries, rivers, lakes, and ground water. Inside the EXO platform you’ll ﬁnd innovations resulting in greater ruggedness, increased accuracy and improved ease-of-use in the collection and transmission of water quality data—cost effective now and adaptable for the future. The EXO platform offers a completely new approach—highly accurate, quick-response sensors in a small, easy-to-deploy and easy-to-maintain package. Gone are large and complicated sensor arrangements requiring complex integration. All EXO sensors have on-board memory and processing, allowing users to easily calibrate and conﬁgure sensors at one location and distribute to various ﬁeld sites. A new metrology system speciﬁcally for EXO offers improved accuracy of conductivity and temperature sensors to better address oceanographic challenges. EXO’s patented reinforced structure, welded Titanium tubes, improved power management, and stable sensor performance allow you to gather data for long periods of time and with fewer interruptions, even in the toughest conditions. Automatic routing enables a string of sondes to pass messages to individual probes. Any time the conﬁguration changes, the system automatically recognises it. A “kick” allows any device to send alerts back up the chain. 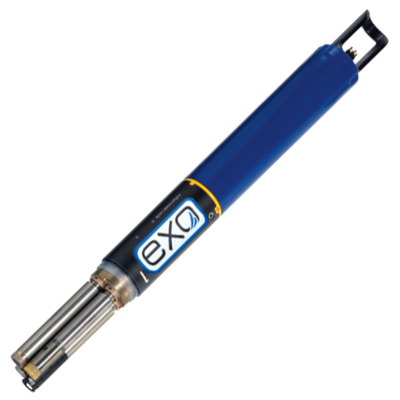 The EXO handheld provides an extremely durable, portable, weather-proof interface to the EXO sondes. The handheld uses a mobile version of the KOR interface software. The KOR Software offers users the capability to easily manage, visualise, and organise large amounts of ﬁeld data. KOR also provides an interface to the EXO products for fast calibration, conﬁguration, QA/QC or data collection. Wires into the end of the YSI ﬁeld cable via ﬂying leads and converts signal to RS-232 or SDI-12 for datalogger applications. Allows connections between an EXO sonde and a PC. Bluetooth Wireless Technology Enables communication between a sonde and a user in the lab and predeployment in the ﬁeld.